You can’t go wrong with pirates. 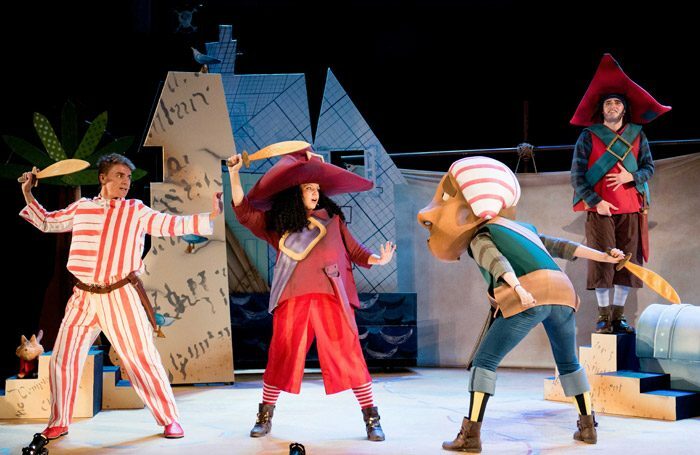 All that swash and buckle, big hats and treasure trove provide excellent ingredients for a show for nursery-age audiences. The Night Pirates makes the most of some of the expected elements, although a rather static cat takes the place of a parrot croaking “pieces of eight”. Much of the pleasure lies in what is conjured in the child’s imagination as – in a few sentences – girl pirates steal the front of Tom’s house and sail with him to confront Captain Patch and his “rough, tough” (actually lazy and cowardly) adult pirates and steal their treasure. Although Miranda Larson’s version draws on some of the language and humour, and Deborah Mingham’s cut-out design recreates the feel of Allwright’s pictures, the show is much more complicated. It begins with an explanation that the story is to be transposed to another medium, has some full-blown musical numbers by Barrie Bignold – very good in themselves and executed in style by the talented, personable young cast – and a morally acceptable reason for lifting the loot. The result is a little too long, with attempts to involve the young audience directly only partially successful. This is a beautiful show – half way to a West End musical – but, given its purpose, it is a case where less would have been more.